Monitors and graphs laptop battery events. Is there a better alternative to MiniBatteryLogger? Is MiniBatteryLogger really the best app in System category? Will MiniBatteryLogger work good on macOS 10.13.4? 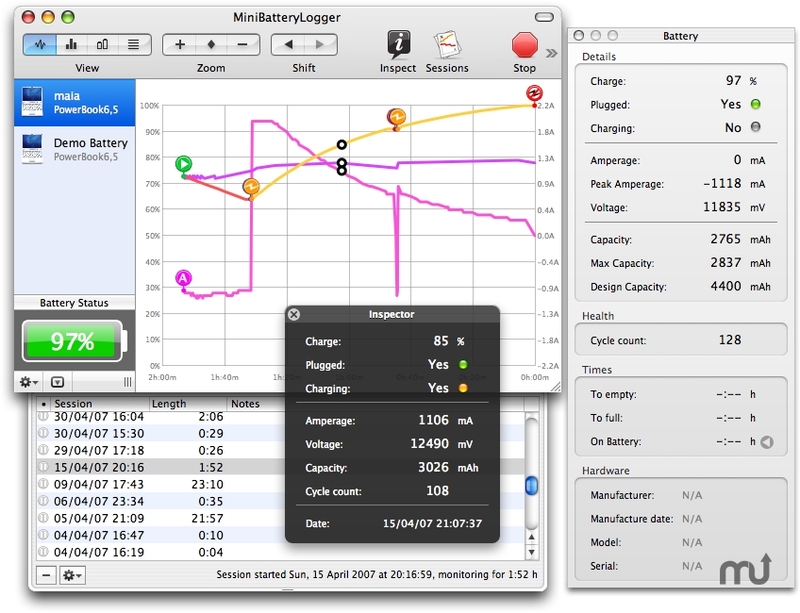 MiniBatteryLogger monitors local and remote laptop batteries. Graph charge, amperage and voltage over time. Save monitoring sessions to disk for later analysis. Save snapshots of battery capacity and cycle count to evaluate battery decay. Monitor remote batteries using Bonjour or by IP address (standalone sharing service daemon available). Compare your battery against the shared archive data. Fixes issue with non English translations where UI is not correctly bound to currently monitored battery. Mac OS X 10.3.9 or later, laptop.